Visitor center hours: Daily 8 a.m. - 4:30 p.m. Even as Las Vegas developments push westward, Red Rock Canyon remains an untouched region of desert beauty. Since being designated a national conservation area in 1990, Red Rock has been a popular escape for those who want a break from fast-paced city life. Over 1 million people come to Red Rock Canyon every year to experience the sandstone cliffs that give off that signature crimson hue. Less than 30 minutes from the Strip by car, the conservation area is conveniently accessible to visitors interested in hiking, cycling, horseback riding, climbing or simply just learning about nature. 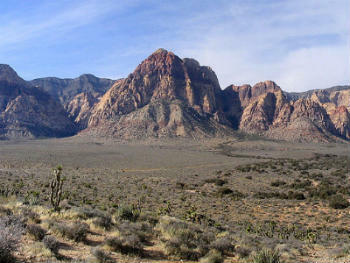 The actual Red Rock Canyon is just a small part of the conservation area, which spans 186,000 acres west of Las Vegas. Visitors can find a variety of cliffs, waterfalls, basins, mountains and other rock formations within its boundaries. However, people commonly refer to the whole area simply as “Red Rock.” This name comes from the iron oxide present in the Navajo Sandstone, giving the rock a reddish color. The region has over 10,000 years of human history, as Native Americans were attracted to its resources of water, plants and animal life. Red Rock Canyon was designated as Nevada's first national conservation area as way to protect these resources and provide a recreation spot for visitors. While the Las Vegas community of Summerlin is just east of the canyon, a buffer zone prevents future developments from encroaching on the land. 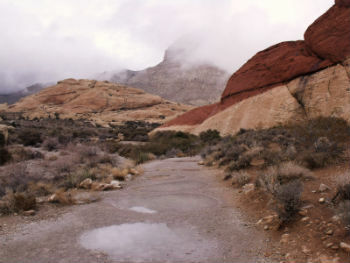 The sites of Red Rock are made accessible via a 13-mile Scenic Loop that runs through the conservation area. This paved road offers an excellent introduction to the beautiful views and branches off into smaller roads that provide access to areas such as High Point Overlook, Keystone Thrust and the actual Red Rock Canyon. To enter, guests must pass through a fee station at the main entrance. Day-long passes cost $7 for cars/trucks and $3 for pedestrians/cyclists/motorcyclists. Just east of the main entrance is the Calico Basin entrance. As the name implies, this road provides access to the Calico Basin trail and is free to enter. The Scenic Loop is especially popular for cycling, as its 13-plus miles can be a challenge. The first 5 miles are mostly uphill while the way back experiences a 1,000-foot decline in elevation. Biking traffic can be especially high during summer as Red Rock Canyon is slightly cooler than the rest of the Las Vegas Valley. Hiking trails are off limits to cyclists. 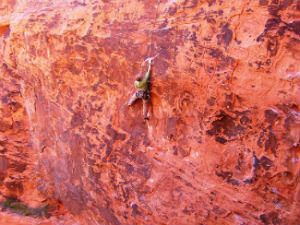 Red Rock Canyon is becoming increasingly popular among the climbing community. The conservation area is without a doubt the most popular place for climbing in Las Vegas, offering bouldering, sport and traditional climbs. With nearly 2,000 routes to choose from, there are options for advanced, moderate and beginning climbers. Red Rock Canyon is a “day use” area, so climbers are expected to leave by dusk when the Scenic Loop closes. However, there are late exit permits available. Bivy permits are also available for those who wish to camp overnight during their climbs. Guests interested in the geological history of Red Rock should be sure to stop at the visitor center, which is a great attraction in its own right. The center features exhibits on the history of the area as well as facts on the rock, plants and animals of Red Rock. A gift shop and supply store is also located at the visitor center. Temperatures at Red Rock Canyon are about 10 degrees cooler than Las Vegas on average, so many city dwellers like to visit during summer to beat the heat. However, summer temperatures can still skyrocket to over 100 degrees, so be sure to check weather listings before you visit. During monsoon season (July - August), flash flooding accompanied by lightning and thunderstorms can occur. For this reason, the Red Rock Canyon campground is closed June - September. In the winter, daytime temperatures will range between 50 to 60 degrees, and it is not uncommon for snow to fall at higher elevations. Aside from the aforementioned campground, the only lodging inside the recreation area is at Bonnie Springs Ranch, which is 7 miles south of the visitor center. This family attraction was designed to replicate an old western town and features various activities as well as a small hotel, restaurant and saloon. 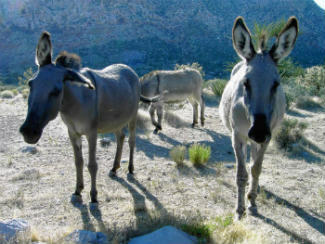 Bonnie Spring Ranch also features a horse stable and offers guided tours of Red Rock by horseback. Cowboy Trail Rides, which is across from the Scenic Loop main entrance, offers a similar service. The conservation area is also just minutes away from civilization in Summerlin. Red Rock Casino Resort and an array of restaurants and stores can be found just down the road.